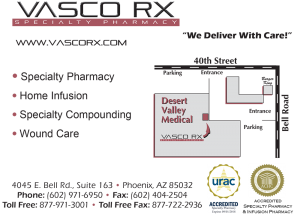 At Vasco Rx we are dedicated to providing the highest level of service and support in the treatment and management of wound care. Our goal is to expedite treatment decisions with an in stock broad spectrum of treatment options. Our commitment to act as a resource for medical providers and their patients when dealing with wounds and confirmed infections for either oral or infused antibiotics and or wound bed preparations that are vital tools in wound care management.